On the edge of Colstrip is the picturesque Castle Rock Lake, where fishermen from across the state flock to catch walleye, pike and bass. 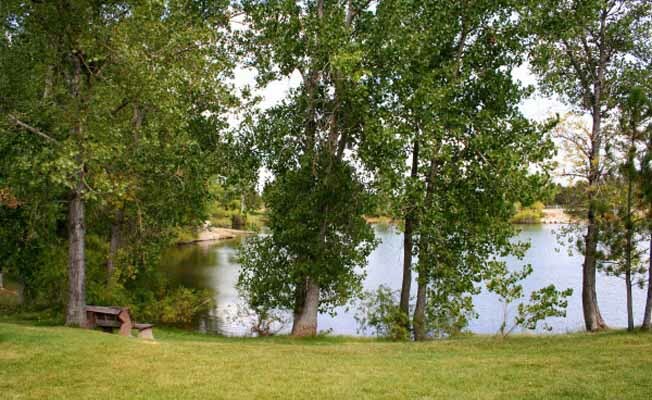 The lake is surrounded by bike paths and picnic areas for summer fun. A walk or bike around the 2 and 1/2 mile lake offers opportunities to watch and listen to a variety of birds the lake attracts. For the hiking enthusiast there is an alternate 3.2 mile loop trail. The peace and quiet, along with the beautiful scenery makes Castle Rock Lake one of southeastern Montana's best kept secrets. Castle Rock Lake offers picnic tables, BBQ, playground, restrooms, shelter - nature trails, horseshoes, volleyball court, boating and fishing. Castle Rock Lake is owned by the power plant and has a conservation easement with FWP for fishing and a recreation easement with Colstrip Park and Recreation District for recreation (trail and boat ramp area). No gas motors on the lake. Castle Rock Lake is located at Highway 39 turn-off out of Colstrip, highway sign plainly marked.Castle Rock Lake is located at Highway 39 turn-off out of Colstrip, highway sign plainly marked.